Home Business Development Employee or contractor? What’s the difference? With the rise of the gig economy, correctly working out whether you are hiring an employee or simply engaging an independent contractor has never been more important. Getting it wrong can be costly, as a recent court ruling shows. This is not an isolated case. Employers need to ensure their working arrangements are correct as some industries are seeing a rise in claims by former contractors seeking compensation for not being paid their full entitlements as an ‘employee’. 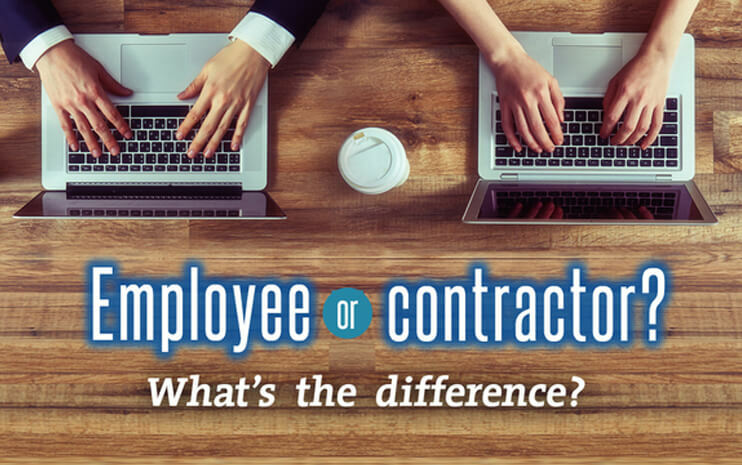 Deciding if someone is an employee or a contractor is not always straightforward, but a key difference is an employee works in the business and is part of it, while independent contractors and subcontractors run their own businesses and are only supplying a service. They can choose their own hours of work and must pay for their own insurance, sick leave, holidays and super contributions. Before bringing any new worker or contractor on-board, always check whether the working arrangement is legally deemed to be employment or a contract. To help you decide, the ATO has an Employee or contractor decision tool on its website. There are many misconceptions about hiring an independent contractor, according to the ATO. A common myth is that this automatically makes a person a contractor. In fact, having an ABN or being paid after submitting an invoice makes no difference to whether an employment arrangement is a contract or employment. Another widespread myth is that the length of a job, or how regular the work is, determines whether someone is an employee or a contractor. Both employees and contractors can be used for casual, temporary, on-call or infrequent work. Businesses sometimes think if they pay less than 80 percent of an employee’s annual income they’re not their employer. This so-called ’80 percent rule’ is only relevant for the ATO’s assessment of personal services income (PSI) and whether or not a contractor can claim business tax deductions. Legally, it’s not a matter of choice as employment status is determined by the working arrangement and specific terms and conditions of the job. Signing a work contract stating an individual is a contractor does not override the true employment relationship and relevant legislation. It also doesn’t remove Pay-As-You-Go tax withholding and super obligations. Sham contracts are usually offered by employers trying to disguise an employment relationship as a contract to avoid paying the required employee entitlements. Both the ATO and Fair Work Ombudsman can impose significant penalties if they determine the worker is an employee. Businesses also run the risk that they will have to foot the bill for back-pay to cover the employee’s unpaid leave and employment entitlements. It’s also in the interests of employees and individual contractors to check their work status is correct. Otherwise they risk missing out on significant financial benefits and the employment protections they are entitled to. Under current legislation it’s illegal for employers to misrepresent a current or proposed employment relationship as an independent contracting arrangement, or to dismiss or threaten to dismiss an employee so they can be re-hired as a contractor. It’s also illegal to make misleading statements to an employee to try to persuade them to take on a contract arrangement for similar work they performed as an employee. Employees and contractors can request assistance from the Fair Work Ombudsman if they believe their rights have been breached. Call us if you would like to discuss your employment status, or to check whether you are meeting all your tax and superannuation obligations for someone who works for you.